Want to support Teesside Hospice on a regular basis? Become a member of our lottery! Entry into our weekly draw costs just £1 per week. Following the processing of your details, a unique lottery number will be allocated and sent to you, along with your first draw date. If you win, there is no need to claim as prize cheques are automatically forwarded to our winners! The lucky winning numbers are published each week on our website and are also displayed in all of our Charity Shops. Teesside Hospice lottery prize structure will be changing on 1/4/2019. At this time a roll-over prize will also be introduced, up to a maximum £10,000 guaranteed win. For full terms and conditions, click the About us tab below. Teesside Hospice Lotto gift vouchers are a great gift for all! Perfect for Father's and Mother's Day, birthdays, anniversaries, a thank you gift or a Christmas present. With a Lotto Gift Voucher you can take the hassle out of present buying whilst helping Teesside Hospice to raise vital funds. When you purchase a Lotto gift voucher the recipient will be entered into the equivalent number of draws i.e. 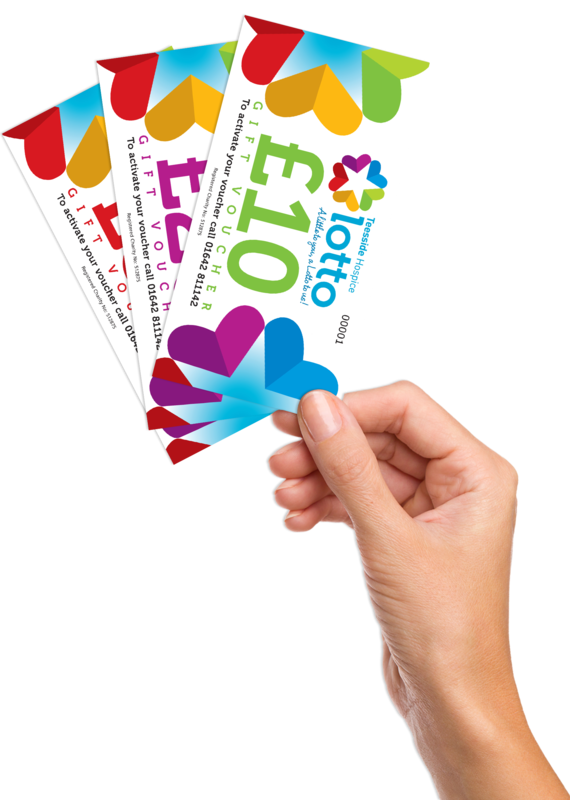 if you purchase a £10 voucher, the recipient is entitled to 10 weeks entry into our Lotto. Entry into the draw means the chance of winning up to £3,000, with a guaranteed 1st prize every week of £1,000. Once the recipient has received their voucher, all they need to do is call 01642 811142 to activate it! 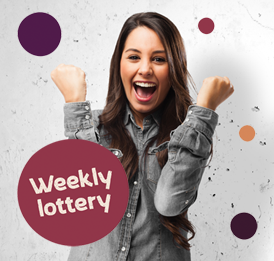 Lotto gift vouchers are available from as little as £10 and the lucky recipient will be in with a chance of winning up to £3,000. Be the bride or groom whose favours help to make a difference! Give your guests an extra special wedding favour with Teesside Hospice Lotto tickets! Our Lotto tickets are an ideal favour (over 16s only), because not only does it give your guests a chance to win a cash prize up to £1,000, but they are a great way of raising valuable funds for the hospice too. For just £1.25 each you will receive a ticket for each guest which is personalised with your names and wedding date. All your guests have to do is check the winning numbers on our website on the day of the draw (this will be provided on the ticket). Ideal table gifts for both men and women! A long-time supporter of Teesside Hospice was delighted to win the top prize of our 13 Lucky For Some prize draw. 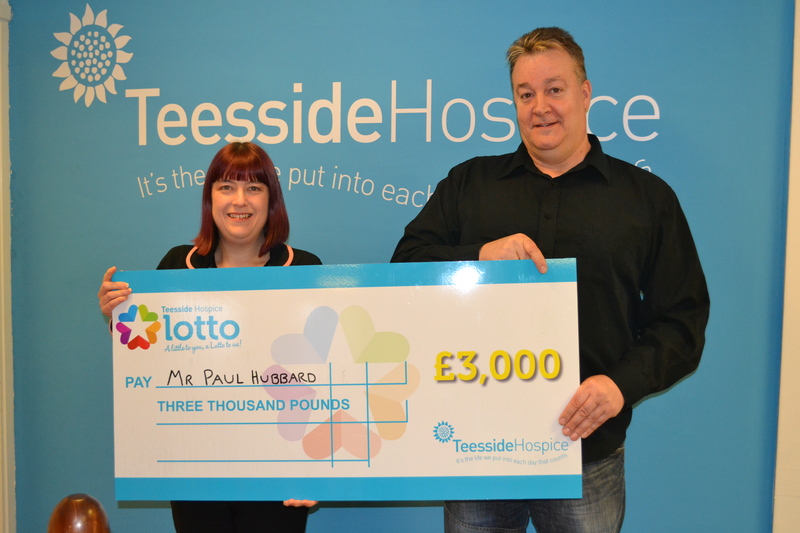 When Hartlepool’s Paul Hubbard received a call from Teesside Hospice to say he had won the top prize, he was speechless. At first, he thought one of his friends might be playing a joke on him, but little did he know he had just won £3,000! Once we had reassured Paul that this wasn’t a hoax, he spent the weekend celebrating his unexpected winnings with his family and friends. Paul’s Mum sadly passed away in September 2014 and had always supported the work of Teesside Hospice and this was the reason why Paul’s family took part in our Easter prize draw. Paul now has plans to use the £3,000 to redecorate parts of his home, which he’s already currently underway with. Could you be next week’s winner? The first ever Teesside Hospice draw took place in October 1995. Since then our Lotto has generated an incredible £10 million – all thanks to the generosity of kind local people! Most people are surprised to learn that the annual running costs at Teesside Hospice are in excess of £2.8 million. We receive in the region of one third of these costs from the local NHS, but still need to raise approximately £6,000 each and every day of the year to keep our doors open. It is only with the support of local people taking part in activities such as the lottery that we are able to care for over 3,000 patients each year. Players must be 16 years of age or over – under age gambling is an offence. How much is it to join the lottery? Joining is free, you simply pay £1 per week to be entered in to that week’s draw. Do I choose my numbers? No, you will be allocated a unique lottery number when you join. All prize winning cheques will be automatically forwarded to you and the lucky winning numbers are published each week on our website within our Results section. Please have your lottery number ready if known.